The term "Iron Man" will usually bring to mind either a red-and-gold armored superhero or maybe Black Sabbath’s seminal heavy metal tune. Well, here’s another Iron Man with whom you should acquaint yourself. This four man unit from the Washington, D.C./Baltimore area have been on the heavy rock scene for a long, long time, but running under the radar. That should now change with the release of South of the Earth, the band’s first effort on major indy label Metal Blade. Yes, as you might gather from the name, the band is heavily influenced by Black Sabbath, but not to the point of mimicry. On South of the Earth, there’s a lot of variety and also a very bluesy, soulful vibe to some of the tunes that is rare in modern metal. Iron Man guitarist Alfred Morris III not only has created one of the heaviest, warmest guitar tones known to man, but he’s also an astonishing and fluid lead guitarist who takes a lot of cues from Hendrix. New Iron Man vocalist “Screaming Mad” Dee Calhoun has an awesome voice to match Morris’ playing and he also helps the band ascend to a different level. This record comes highly recommended to those who like their music heavier than lead but with a lot of soul as well. Right off the bat, you get a fat, juicy, Sabbath-flavored guitar tone and Al Morris III’s killer soloing. This song is heavier than a cast iron wedding cake. Screaming Mad Dee Calhoun’s vocals are smoky, rough yet tuneful. He is the man for whom this band has been waiting. Also get a load of Louis Strachan’s ultra thick bass sound…wow! He’s right up there with the likes of Geezer Butler, Geddy Lee and Lemmy. This tune is a perfect introduction to the Iron Man sound. This is even better than what came before. Man, my words fail to describe you incredibly massive and thick the guitar riffing on this monster is. There’s a feeling of funkiness and groove lurking beneath the heaviness that drives this forward like a juggernaut. Calhoun’s super powerful vocals cut through the tune like a beacon through the fog. I was surprised by the “whoa-oh-oh” vocals on the chorus. That’s something new for Iron Man. The funk connection becomes even more prominent here, where Strachan’s bass takes front and center. Morris’ guitar soloing is very Hendrix-like and hails back to the dawn of heavy music. This is not one of my favorite cuts here, yet it is very respectable in its own right. Opening with heavy phased guitar sounds, this sets up a super heavy grinding groove. Calhoun’s vocals take a sinister turn, which is perfectly appropriate, because he is singing from the perspective of Satan himself, who has finally come to take over and take the human race home. Lovers of Sabbath’s Master of Reality album will be digging this tune the most. The song is full of the same evil vibe that that classic album had, right down to Morris’ wickedly bluesy solo. Morris definitely has a lighter side to his playing and shows it on this brief, beautiful instrumental. 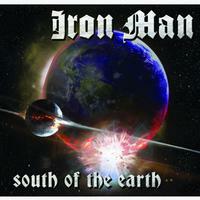 Black Sabbath used to do mellow stuff like “Laguna Sunrise” and this occupies the same position for Iron Man. It is a really pretty piece of music. An aggressive, hard-charging song, this is just straight up heavy metal, without the doom and blues elements prevalent in the rest of Iron Man’s material. The song is actually quick paced and packs a powerful punch. Again, Louis Strachan’s bass work almost overpowers every other instrument. I haven’t heard such a dominating bass sound since DD Verni’s older stuff with Overkill! This killer gets my vote as the best song on the album. It’s a loving and faithful tribute to H.P. Lovecraft’s classic “Dunwich Horror” tale, with Calhoun’s vocals following the story in every detail. The “Half-Face” part is an amazing instrumental intro with a very Asian/Middle Eastern feel. Then it switches to a gigantic monster of a lumbering riff that again brings the heaviest Sabbath to mind. This whole song is a riff-lover’s delight that will bring doom metal fans to their knees. The vocals, the rhythm work and the lyrics all combine to create a real epic and the climax with the demon voice roaring “YOG-SOTHOTH! FATHER!” is mind-blowing. A mysterious, subdued theme begins this tune, with Calhoun’s vocals at their most melodic and restrained. However, it isn’t long before another rubbery Sabbath-style groove erupts with the trademark Iron Man sound. This song is a little bit different because synth work accentuates some of the riffing. And as usual, the riffing is extremely heavy. I found the ending here to be kind of weak, though. This is inspired by an old Stephen King story written under his pseudonym of Richard Bachman. It really shows Iron Man’s versatility. The beginning is truly balladic and again Calhoun and Morris show they are just as talented in their mellower mode as churning out colossal hooks. The song builds up to more thick, crushing heaviness. The swing between heavy and mellow continues for a good while. Morris’ guitar soloing is very Iommi-like and would give pause to the great man himself. I also have to give a shout out to Jason Waldman’s strong and steady drumming.